Fast and technical, this album starts off different than the albums before it. 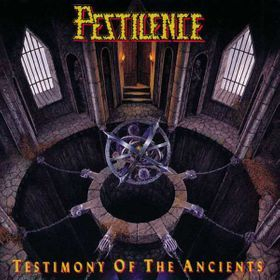 Adding a more melodic groove than previous albums, while still retaining the thrashy feelings Pestilence brings to the table, this album kicks your face in. Keyboards and samples in the mix right in the first few minutes adds a new touch compared to their first and second release. But don't let that fool you, the songs are still heavy as hell, even heavier even, the album has a darker more ritual feel to it, as if the shredding between the guitars and howling vocals, were to raise a dark shadowy creature through the dry, cracking Earth at breakneck speeds. The grooves are groovier, the pits are moshier and overall has a fun feel to it, if breaking someone in half or cutting their head off with a five foot long executioner ax is your kind of fun, like mine is. Having sixteen tracks to it seems almost daunting and a extremely long drawn out listen would be the road ahead, it's not quite so long of a journey. Eight of the sixteen tracks are samples or instrumental pieces that break up the songs into nice little segments keeping that ritualistic feeling throughout very strong, and very dark. Many songs have moments of a slow groove that makes you really want to pump your fist in the air and slam your head into a stage with full force. Many of the solo's on the record have a very inspirational and extremely melodic hook in them. They pull you out of your listening space, through the air and into the black vast void that is space, only to stop and let you spiral back down to Earth in a firey ball to come back later and re pick you back up. The guitar sorcerery won't let you die while listening to it, it will merely pour the metal right back into you, and keep your ever beating iron heart from stopping out of start and stop shock. Definitely a death and thrash metal fan album, but it's easy to intake, and easy to love and bang your head to.